October 31, 2008 marked several important occasions. My mom’s birthday (she’s a lot younger than John McCain.) G’s first time trick or treating – and ours too. And our first night out without kids in about three months. Even though this is G’s fourth Halloween, we’ve cleverly (or lazily) avoided trick or treating thus far. Since he was about 18 months or so, we’ve carved pumpkins and hung out at home handing out candy to other people. We didn’t even get him a costume – he usually just hung out in a diaper or underwear. Apparently it didn’t occur to him that he could JOIN the kids coming to our door for candy. But this year it changed. We talked about what he wanted to ‘be’ for Halloween. A bat. And wouldn’t you know it I couldn’t really find a bat costume in the two places I looked. Which meant I had to sew him some sort of bat-like-wing-contraption-thing. His bat ears ended up being black fabric triangles stapled to a black headband/ear coverer thing. Made in the ten minutes before we had to leave for today’s preschool Halloween party. Which he wore for exactly five minutes upon arriving at school. Just long enough for me to take a picture and for his teacher to ‘see’ what he was supposed to be. 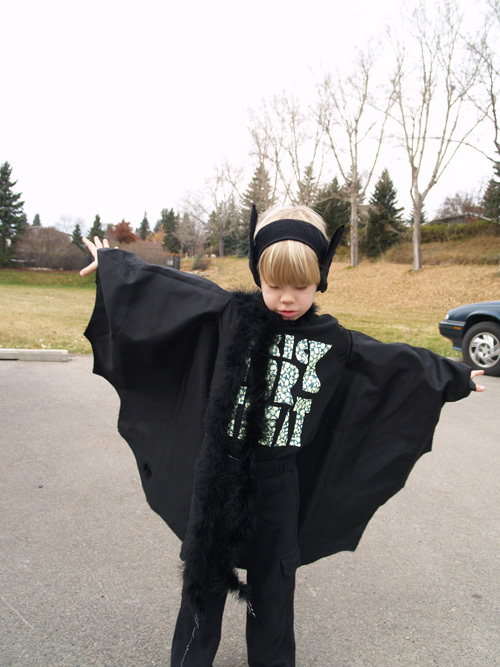 He wore the cape for about twenty minutes before it was discarded. Which means he was just a boy wearing black pants and a black t-shirt that said ‘trick or treat.’ What’s THAT? But he was stoked about trick or treating and spent the thirty minutes before we left pacing the living room floor, continually asking: ‘now, are we going trick or treating?’ The chance to go to other people’s homes and collect candy was just the leverage we needed to get him to wear his costume. J and I just stood back and watched our child, the product of two introverts who eschew interactions with strangers at all costs, charge up front steps and ring the doorbell or knock on the door way too many times. He barely uttered a Happy Halloween or a Trick or Treat before he charged into the strangers’ homes eager to see their candy selection and choose a piece for his Thomas the Train candy bucket. The moment the candy hit the bucket, he’d turn around (muttering a thank-you or a Happy Halloween over his shoulder upon being prompted) and announce: ‘let’s go to the NEXT house.’ Before he’d even descended the steps of the current house. A determined boy, who barely stopped to adjust his drooping ‘ears’ as he went from door to door. 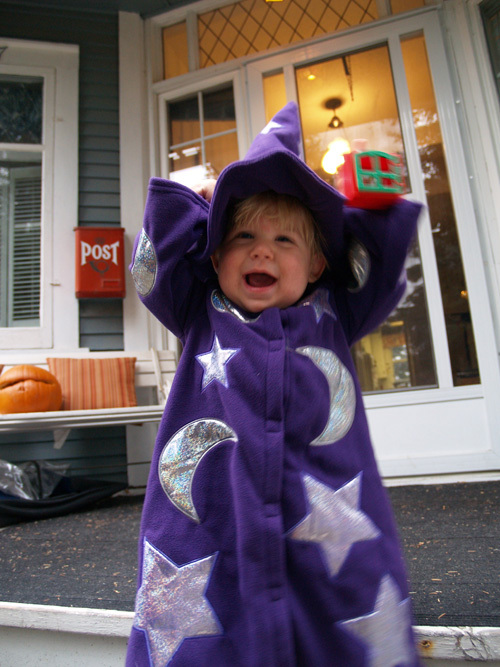 The Wizard didn’t really partake in the activity aside from looking cute. He was happy just to sit upon his father’s shoulders and take it all in: the decorations, the determined brother, the candy gloriousness of it all. We only visited about ten houses total. A few on our street and the street parallel to ours. We came upon one house where the residents had probably spent the entire month of October getting ready for Halloween. There was a ‘scary’ tent in front of their house where older children or parents went in to select some candy and got ‘zapped’ by air when they removed a piece from the bucket. There was a ‘graveyard’ leading to the adjacent house, with gravestones and carved pumpkins and a coffin along the way. At the next house there was an ‘adult’ treat station on the front porch, where they handed out disposable cups of Bailey’s for the parents. And as you exited, a witch was being beheaded. At our house we had a glowing, rotting pumpkin on the porch and the trick or treaters got Werther’s candy. Once G’s bucket was full he was ready to go home, which was nice. How much candy does a four year old need? He dumped his loot out on the carpet and selected a piece of bubblegum to feast upon (after we’d ‘forced’ him to eat ten bites of pasta.) The rest of the sweets were ‘hidden’ (one by one) on a kitchen shelf. After consuming bread dipped in garlic balsamic oil, and bread filled with brie topped with roasted garlic, and steak with garlic cream sauce served with vegetables all laced with garlic, we left, feeling a little garlicked-out. We headed to another place for dessert – I just couldn’t eat any garlic with my ice cream. GREAT costumes. Such cute trick-or-treaters! Cutest Bat and Wizard ever. At A’s preschool the teacher had a big box so that the kids could deposit their “accessories” (yes, she did indeed use that term) as they day went on. In the box went the wings, capes, hats, gloves, wigs, wands, etc. Which brings to mind the question… why again do we dress them up? Oh yes. That’s right. For our own pleasure.